Produce stands and hole-in-the-walls, local oddities and museums, a road trip to the beach is not just about the destination; it’s also about the journey. If you’re in northeastern North Carolina and heading toward the Outer Banks along Highway 158, there are plenty of roadside attractions that offer more than just a chance to stretch your legs. Water has defined the lives of those who’ve lived on the sounds and swamps of northeastern North Carolina for generations. The region’s changing tides are captured beautifully in Elizabeth City, a storied port that sits on the mouth of the Pesquotank River, which has been home to numerous industries ranging from lumbering to oyster processing. 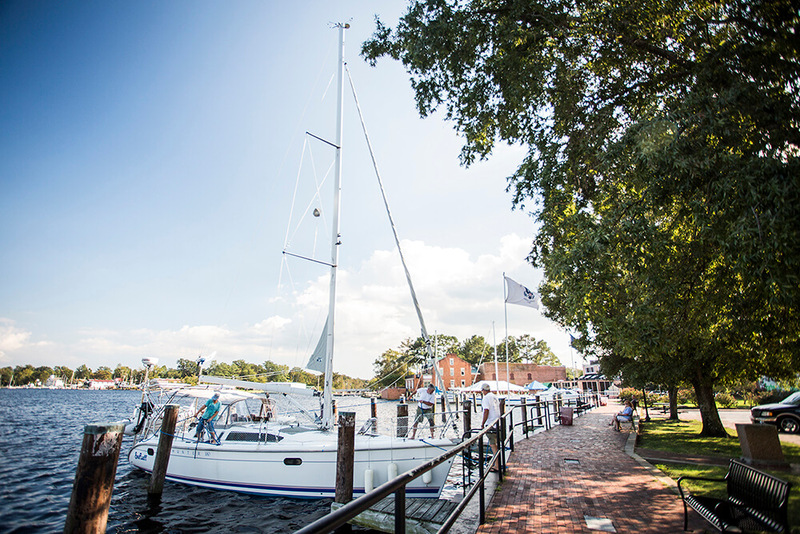 After taking a stroll along the waterfront that runs next to quaint downtown storefronts, head to the Museum of the Albemarle, which holds exhibits that span centuries of history. In 2017, the museum celebrated its 50th year as a cultural sentry for the heritage of 13 surrounding counties. During your visit, peruse artifacts from the region’s first Native American communities, the American Revolution, and the Wright Brothers’ First Flight. Don’t miss the temporary exhibit on the origin of wedding traditions and customs in the Albemarle as well as the photo exhibit that captures the lives of black farmers in the country. 9 a.m. to 5 p.m., Monday through Saturday. Closed Sunday. Free. Visitors from all across the country and world flock to the Outer Banks to enjoy the untamed beauty of our barrier islands, and they’d be remiss to return home without first trying the oldest style of barbecue in the United States. 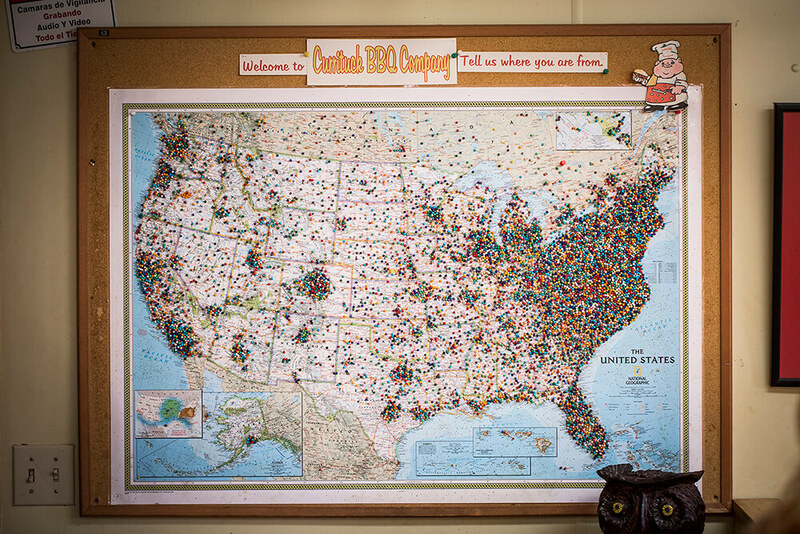 Currituck BBQ Company has their fix; the popularity of the joint is captured on the giant map next to the door, crowded with colorful pushpins that mark where guests are from. Menu items like fried chicken gizzards and brisket burnt ends might mystify the explorer who is less familiar with barbecue, but they only indicate the down-home authenticity of the place. From sweet potato casserole to pickled beets, there is no shortage of sides, and three types of homemade sauces — vinegar-, mustard-, and tomato-based — aim to please. Enjoy your meal on the restaurant’s covered patio on a nice day, or pack it over ice to-go — they’ve seen it before. If you’ve heard that a woman named Cindy makes great cakes in Barco, you’re not wrong. 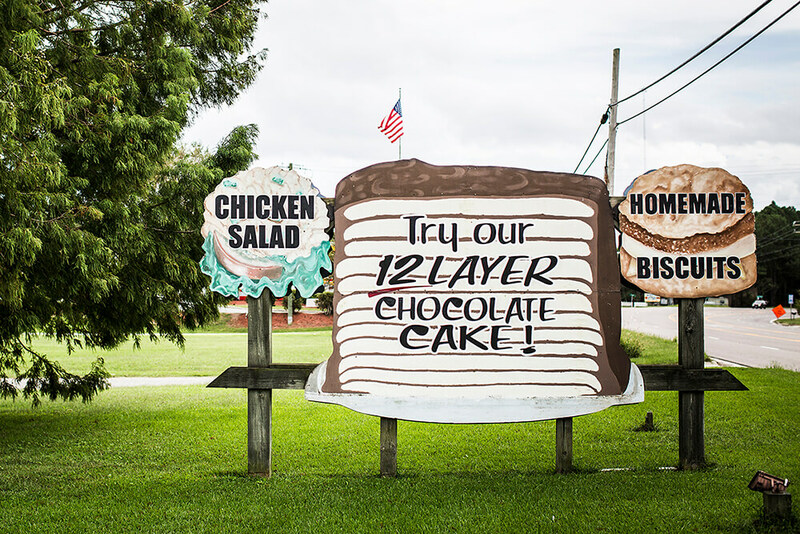 But if you’re driving along U.S. Highway 158, you might be surprised to learn that the place where you can try one of her storied 12-layer cakes is inside of a Citgo station. Just look for a sign out front that is nearly true-to-size and immortalizes the gargantuan cake in addition to Cindy’s homemade biscuits and chicken salad. Cindy Spain and her husband, Kevin, operate the filling station and a catering business, but cake’s the thing here. While somewhat of a novelty, the dessert has its own share of lore in Southern kitchens as home cooks stir up friendly competition over who can create a cake with the most layers. “There was a lady on Church’s Island that made a 10-layer cake,” Cindy said in a 2016 interview. Cindy developed her own recipe that yields 12 layers. Impossibly thin sheets of buttery cake make for an even cake-to-frosting distribution that will please any chocolate lover. Cindy’s Kitchen also offers other flavors, such as coconut and caramel. You can purchase a whole cake or a slice to go. One bite begs the question: Was there ever a more perfect driving snack? Nope. A more practical, portable snack? Probably. But more perfect? Never. Stop 4: Sanctuary Vineyards, plus hang-gliding! When John Wright was told that he wouldn’t be able to grow European grapes on the Outer Banks, he planted them anyway. He doesn’t back down easily from a challenge. “This is not the best place in the world to grow grapes,” Wright says. “It’s not world-famous, at least not yet, and if it is, it’s because people put an irrational amount of labor into it.” On more than 20 coastal acres at Sanctuary Vineyards, every vine is touched by human hands — not machines — 30 times each year, which is double the industry average. 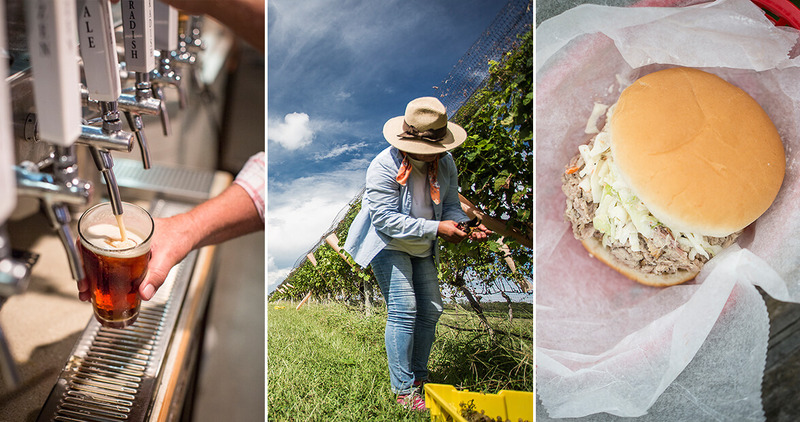 Hard work shows through in the quality of Sanctuary’s wine, which isn’t just of the muscadine variety. The vineyard’s 2014 Pearl is made with Albariño, a Spanish white grape, and won gold in the San Francisco Chronicle Wine Competition. See for yourself by visiting the tasting room or taking a free tour that’s offered every Wednesday at 1 p.m. during peak travel months. 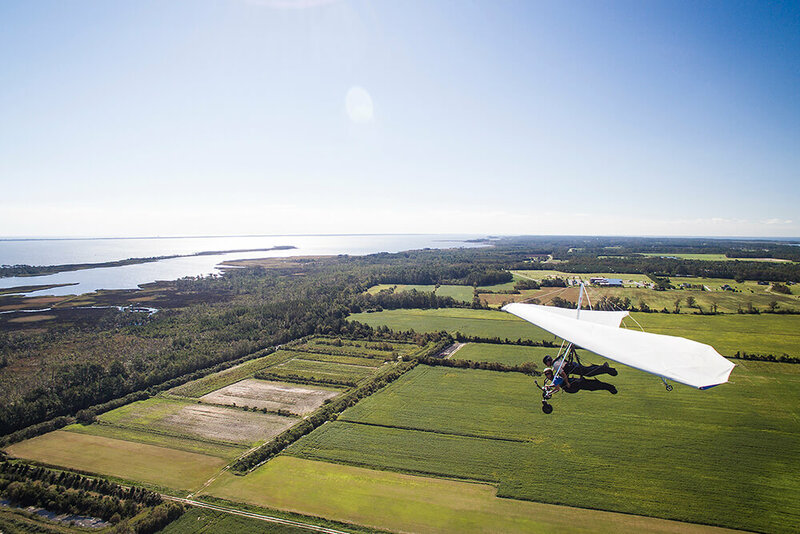 For a big-picture view of Sanctuary Vineyard’s operations, take to the skies in a hang-glider that’s towed by a plane. 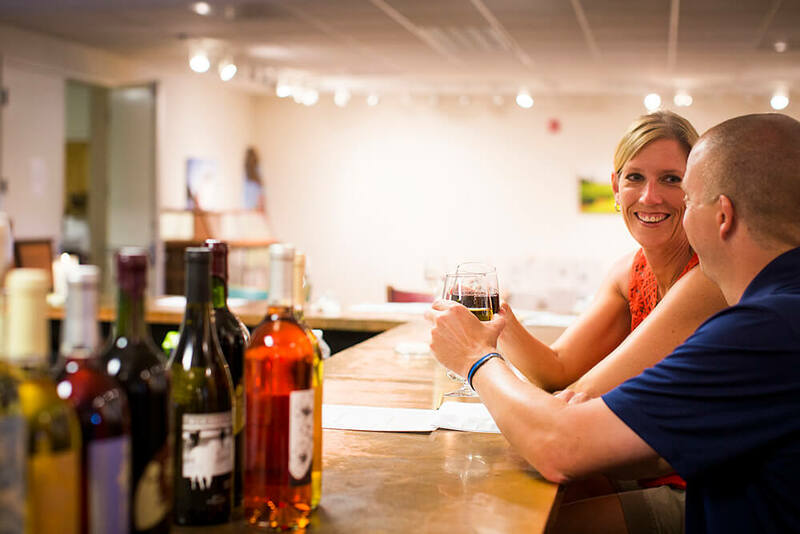 Flights depart from The Cotton Gin, a gift emporium, which is located next door to Sanctuary Vineyards. The place might be called Weeping Radish, but there are no tears in anybody’s beer here. 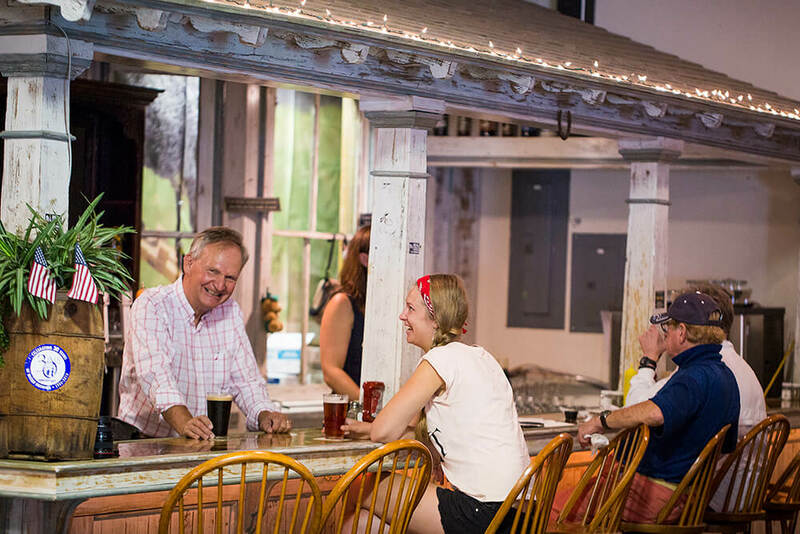 Owner Uli Bennowitz is a jovial man who is revered as being the founding father of North Carolina craft beer. Weeping Radish opened in 1986 after Bennowitz championed a law that allowed brewpubs to exist in North Carolina. The happy result of his efforts: A growing lineup of beers that nod to the styles of Bennowitz’s home country of Germany. The taproom is modest but delightful, and the menu boasts hearty, artisanal sausages made by Weeping Radish’s butchery. It’s the ideal place to kick back when you want to take a break from beachgoer traffic. (Conveniently, it’s on the right-hand side of the highway when you’re heading into the Outer Banks, which makes for easier merging.) Stop by on a Tuesday or Wednesday morning for a tour, usually given by Bennowitz himself. Reservations recommended.